More Consumers Are Asking Their Doctors for Drug Samples - By Name. More consumers are asking their doctors for prescription drug samples - and getting them. And these informed, proactive patients are more likely to fill prescriptions for the brands they have sampled than consumers who do not ask their doctors for samples by name, according to Ipsos PharmTrends a syndicated service that tracks consumer purchase behavior of both prescription and non-prescription drugs. "Consumers are not only requesting prescriptions for advertised, brand name drugs, they've also become savvy enough to request samples from their doctors. Direct-to-Consumer (DTC) advertising by major pharmaceutical drug manufacturers has done a good job in raising disease awareness and brand recognition among targeted patient populations. As a result, patients are asking for drugs by their brand name whether it be for a sample or a prescription. This behavior is further evidence of rising levels of consumer empowerment when it comes to their healthcare and treatment options. The flip side is that, while DTC helps drive patients to request drug samples and ultimately prescription fulfillment, consumers who request samples are more likely than non-requesters to be uninsured," said Fariba Zamaniyan, director and spokesperson of Ipsos PharmTrends. The percentage of Americans who fill prescriptions for drugs is increasing and so is the proportion that receives prescription drug samples from their doctors. Across most of the leading DTC spending drug classes, Ipsos PharmTrends observed double-digit growth in patient receipt of samples. This advance in sample receipt can be attributed to increasing competition among drug companies, which promote drug samples to encourage patient trial of their products. This behavior was particularly evident in categories where competition has intensified, spurred by new drug launches such as Clarinex, Advair and Nexium as well as drug recalls from the market such as Baycol for elevated cholesterol treatment. Across these leading DTC drug classes, a quarter-to-a-third of the sample recipients requested the prescription drug sample received. With the exception of the Proton Pump Inhibitor (PPI) drug class indicated for treatment of acid reflux and Cox-2 Inhibitors indicated for the treatment of arthritis and pain, the leading DTC drug classes experienced double-digit growth in patient requests for samples. In fact, this rate of growth for sample requests is more significant than the proportions that ask for the prescription instead. The growth in sample requests in most cases is consistent with DTC initiatives in these categories. For example, Baycol's exit from the market prompted competitive Statin brands to promote trial through free drug samples to attract former Baycol buyers now available for conversion to competing Statin brands. 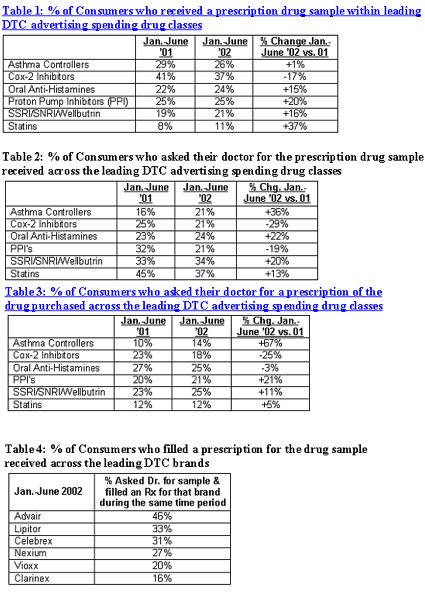 In categories with new drug introductions, such as the Asthma category with the launch of Advair and the Allergy category with the launch of Clarinex, there was significant promotional spending on free samples to attract new buyers to the market as well as promote shifting from competitive prescription or non-prescription drugs already in the market. With all this growth in sample requests, are consumers who receive these samples going on to fill a prescription for those brands? Depending upon drug class and need - for instance, episodic versus chronic condition - some heavily promoted prescription brands realize higher levels of script fulfillment than others. Among those consumers who ask for a free drug sample for the top DTC spending drugs, between one-quarter and one-half of the consumers actually go on to fill the script for the drug. 16% of Clarinex sample recipients in the January through June 2002 period not only received a sample for Clarinex but also filled a Clarinex prescription. This level is less than half that realized for Advair and Lipitor. Both treat conditions chronic in nature. For Clarinex, the sample supply coupled with the episodic nature of the condition it treats (allergic rhinitis) allowed patients to remedy their condition with the sample received during these six-months. DTC is not alone in prompting consumer/patient requests for prescription drug samples. In most cases, consumers who ask for samples are less likely to have prescription drug insurance. The lack of insurance and correlation with sample requests is most evident for Statins, Cox-2 Inhibitors, and Asthma Controllers. "Promoting sample requests in DTC messaging has proven to be an effective strategy to promote brand awareness and generate trial across the leading DTC spending drug classes and brands" stated Ms. Zamaniyan. "However, drug manufacturers need to continually monitor the ability to convert trial via sample receipt to script fulfillment over-time. There is a danger that exists with over-sampling within certain therapeutic classes such as allergy treatment. Script fulfillment within this category can be delayed resulting in lost sales as patients are enabled to treat their symptoms with the sample supply received from their doctors" stated Ms. Zamaniyan. To view tables CLICK above on 'More Images'.